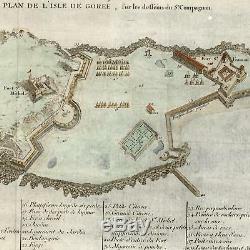 Plan de l'Isle de Goree. (Goree Island- West Africa- Dakar, Senegal). Issued 1746, Paris, by JN Bellin. Beautiful mid-18th century antique map, engraved with outstanding appropriate hand color. Key across the bottom identifies 42 specific important structures, including Fort St. Represents the tiny island off the coast of Dakar, Senegal during the midst of it's primary early historical useage as a stopping point for the slave trade. It was on this island that cargo of men were loaded onboard ships for export as slaves to the Western world. See wiki, a world Unesco site today, captured here at the height of the colonial European "ownership" and international slave trade. Light uniform paper age toning, remaining clean - a near-superior visual example. 7 3/4" x 14 1/4". Tooley's Dictionary of Mapmakers, 1. We do not sell modern reprints. 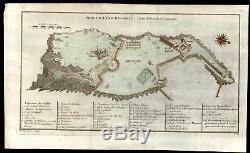 The item "Africa west Goree Island Slave trade era Senegal 1746 Bellin detailed old map" is in sale since Thursday, April 19, 2018. This item is in the category "Antiques\Maps, Atlases & Globes\Africa Maps". The seller is "oldmapsoldbooks" and is located in Dover. This item can be shipped worldwide.